A controversy is developing in Cornwallis, Washington where residents of a neighborhood bordering the army’s Joint Base Lewis McChord (JBLM) say the city council’s latest ordinance is yet another example of an overreaching government. During the Christmas recess the mayor called a midnight city council meeting, with no public notice, and reportedly of all places in a Seattle pub. After seven exhausting hours the council voted 5 to 4 to enact a law that was purportedly intended to ease the severe traffic jams along Interstate 5 which runs through JBLM. But these intentions some believe were not so benevolent. The law allocated nine tracts of park land to build high density housing for military personnel and their families. The land is just west of the Berkeley Bridge and soldiers going to and from the base would not need to use I-5. However the land is platted within the realm of the Lafayette neighborhood and its homeowner’s association. 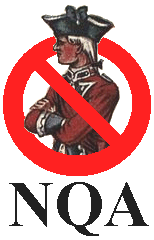 Residents angrily objected to their former park being taken over by the city, and in response turned to a relatively unknown civil rights advocacy group, the No Quartering Association, (NQA) to seek redress for the city violating the Third Amendment’s prohibition of quartering soldiers in citizens’ homes. Unfortunately for them, the worst was yet to come.